We have lived in our house, built in 1931, for almost fourteen years. Within the first year of living in our house, we experienced September 11th, endured flesh-eating bacteria and welcomed our twin girls. While no year will quite match the first, the years that followed were generously filled with birthdays, holidays and gatherings for a family of five, their pet Shih Tzu and all of their family and friends. It has also seen its share of wear and tear. Through the years, we haven’t done much renovation or many improvements to our home. And when the bottom fell out of the real estate market, so did our property value. Which means we are likely to be here for at least another 10 years while we endeavor to improve upon what we purchased in 2001. Most of the changes we’ve made have been cosmetic, mostly painting. Through the years we have been through two wall-to-wall carpets in our living room but in 2012 we did our first major improvement to the house, we had the original hardwood floors sanded and stained as well as some nice tile laid in the kitchen. But that’s about it, folks. The list of remaining improvements is long and bit by bit we are trying to tackle them, somehow managing to squeeze it into our schedule and budget. This year, we are getting our roof replaced. Let me tell you, if you don’t already know, this is a tight squeeze into both our schedule and our budget. In fact, this year’s spring break vacation budget has been reallocated to the roof replacement. Try explaining to the children that we aren’t going to Florida just like “all their friends” because we cannot make it through one more lengthy and brutal New England winter without sustaining permanent damage. Not fun. 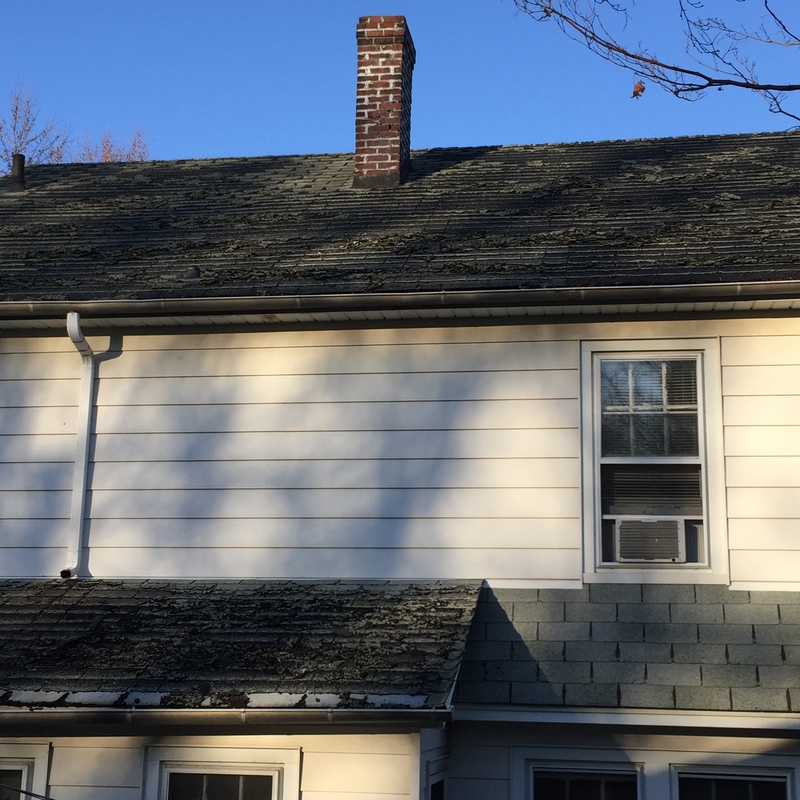 The roof of our 1931 Colonial, awaiting sparkly new shingles, chimney repair and bright shiny gutters. While I am most certainly missing the warm weather, sandy beaches and tropical cocktails, there is something almost euphoric about scratching something so monumental off of the proverbial “to do” list. Maybe next year we’ll get to go see the Mouse. This year we can look forward to weathering a thunderstorm without waking up to a smattering of asphalt shingles on our lawn. Welcome, January, you cruel month you. For the past six weeks most of us have stuffed ourselves with turkey, attended decadent holiday parties, unwrapped gifts galore and rang in the New Year with perhaps a little too much to drink. Now we are perched at the top of 2015 preparing to traverse the road before us, no matter how smooth or rough it may be. We are at the point now when we face the burgeoning debt accumulated over the last few months, start setting our alarm clocks for the daily grind that now seems to grind harder and begin the hibernation forced upon us by winter’s chill. Yesterday, I was looking for a Phillips screwdriver to fix a chair that had gone wonky. For weeks that screwdriver had been in a certain drawer. Naturally, when I went to get it, it wasn’t there. Was it in the Elf Kit? Was it misplaced after Izzy put batteries in her RC quad-copter? The only thing I knew was that I couldn’t find it when I needed it. 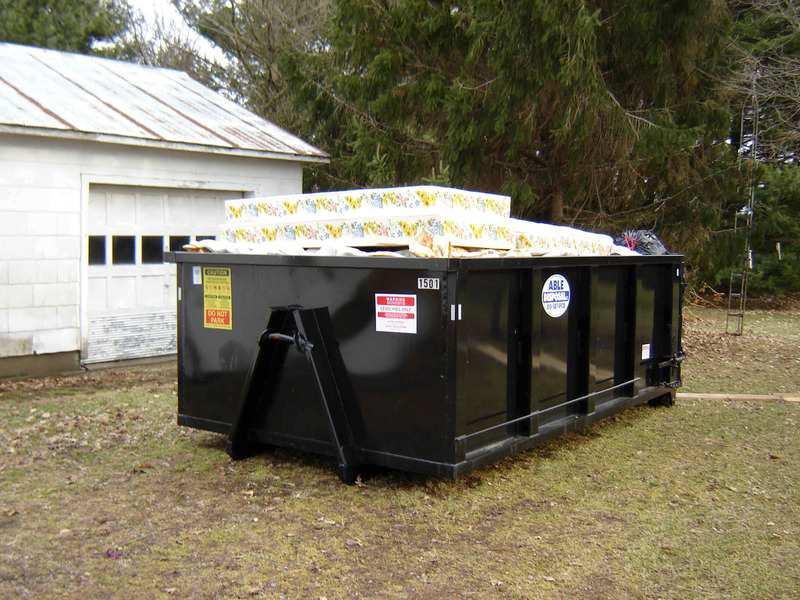 So that got me to thinking about the things which I will, for want of a better label, call “my stuff.” I spent a good deal of time this year filling two 10-yard dumpsters with “stuff” that we no longer used or that was damaged beyond repair. 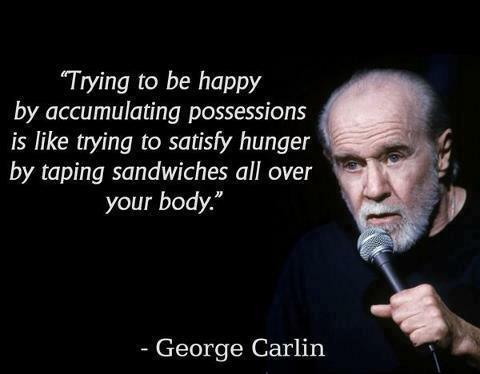 There were many moments during that process that the word “stuff” made me think of this infamous George Carlin skit. Every year, shortly after Thanksgiving, my husband and I get requests for lists of what we want for Christmas. I try throughout the year to add things to my wish list and to my children’s so that when I am asked it is only a matter of sending a hyperlink. As I speed toward my 50th year on this Earth, I find that I am less concerned with tangible objects and more with experiences which, again, leads me think about stuff. So, I’ve come up a timeline, of sorts, about stuff. Normally, when the New Year comes, I don’t succumb to the trend of resolving to do things better, faster and/or more efficiently. Generally speaking, I don’t make resolutions because I believe that making them is a way of just setting yourself up for failure. I mean, who am I kidding? I won’t lose 30 pounds, I won’t stop having diabetes, I won’t stop living paycheck to paycheck and I won’t write the next award-winning play/novel. Does that make me a realist or does it make me a pessimist bound to fulfill her own prophecy? Hard to tell. So began last year’s post about my New Year’s resolutions followed by a list of somewhat attainable goals. Looking back on the year, I can see where I succeeded and the many places I faltered. 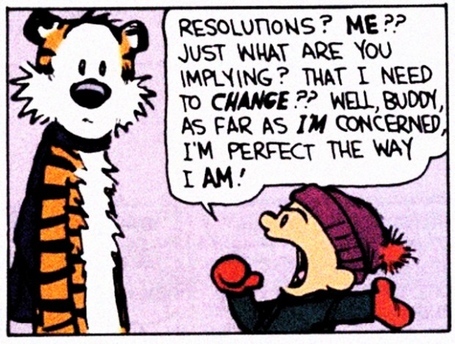 So, let’s take a look at last year’s resolutions, shall we? Be accountable for my actions and the impact those actions have on my life and on the lives of others. I think I have learned to be more accountable for my actions. When I screw up, I more readily admit that I screwed up. I’m still not perfect and, to be honest, this is sort of an ongoing resolution that will never be attained 100%. Be more honest with myself and with the people in my life. Especially myself. I have learned to trust people a little bit more and have a few friends that I have grown closer to this year. Honesty is hard and I am still not there. But I am trying. Be more relentless about saying “I love you” to the people that matter. I am not what you’d call an affectionate person. I’m not a hugger, a kisser or a PDA person. I still find myself making a concerted effort to say “I love you,” which means that I’m still working on this, too. Clean the basement and attic and utilize the space for something that is more effective than being a hiding place for our junk. Well, in 2014 we filled two 10-yeard dumpsters with junk. The attic was almost there and then one of the twins made it her bedroom. She’s a good sport and lives among boxes of Christmas decorations and toddler clothes. I suspect this project will be done in short order as will the basement, which is more than halfway there. If you’ve seen either our attic or our basement, you would know what at truly daunting task it is. Complain less. Comparatively speaking, I’ve got it pretty good. I still complain. Or maybe, more appropriately, I pass a lot of judgment. My kids accuse me often of drinking too much “judgy juice.” Fortunately, I have a very small group of people to whom I voice my complaints and judgment. Do more jigsaw puzzles. I did a lot of jigsaw puzzles during our two week vacation in Maine. Once I have a space where we can keep a puzzle going (or the puzzle board that has been on my wish list for two years now), I think I will do more puzzles. I love working a puzzle while the TV plays in the background. Eat more fruits, vegetables and seafood. Eat less fatty meats, cheese and carbs. Well this has been a roller coaster of a year for me in terms of my diet. I made a lot of headway and lost about 20 pounds but then managed to do a 180 and reclaim all of that lost weight and then some. I am at the heaviest I’ve been in my whole life, with the exception of when I was pregnant with twins, which tilted the scale over the 200 pound mark. While weight loss and better living is a boring resolution, it clearly needs to be a priority in 2015. Eliminate jealousy from my life and realize that another person’s success does not mean that I have failed. I know I should not judge my own self-worth when I see other people succeed. I think that social media does not help. People tend to bring forth their best or their worst selves on social medial. While I can just roll my eyes at the complaining, I can’t help but envy the person that got the promotion, has the perfect family, traveled to exotic places far and wide, got their show published/produced, etc. There are two things I can think of to combat this weakness: do more that will help me achieve my personal goals and stay away from social media. Hard to tell which one is the more attainable goal. Invite my friends into my home more often, for no special reason, and not worry about how clean the house is before I do it. I’ve been better about not caring about the mess so much. Now I just need to de-clutter my calendar so that we can host more gatherings. Knock the socks off of the people I work with. Impress someone at Gartner and get a long overdue promotion. Well, as we head into the new fiscal year, it is hard to tell whether or not I will actually be promoted. I do know that I have worked harder than ever this year and I know that it has gotten noticed. While my paycheck and title may not reflect that, I am proud of the work that I’ve done this year. Learn to say “no” more. I have had moments when I’ve said “no” but when I look at my schedule, I see that I still haven’t mastered the “just because you can do it, doesn’t mean you should” philosophy. I have a lot of talents and I want to share them but sometimes that one extra thing is what tips me into feeling overwhelmed and anxious. Learn to sew – even if it’s just basic things like place mats, pillows or the hem on a pair of pants. While I found my sewing machine in 2014, I did not take it out of its box. I didn’t even pick up a needle and thread in 2014. So I’m going to keep this one on the list. Let go of the need to do more and be more and realize that, for today, I’ve done the best I can, and that’s enough. I am a person that continually strives for perfection, so letting go is not in my DNA. We’ll add this to the “still working on it” column. Lower my A1C. 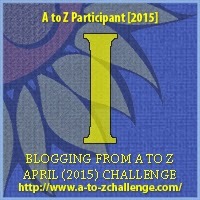 While I have lowered my A1C incrementally from appointment to appointment in 2014, it still needs a vast improvement. This really goes hand in hand with the managing of my diet. Master my “fancy camera” and learn how to take really good photographs. Well, Santa brought me some new lighting equipment, a new camera bag and some fun circular flashes for my lens, so I am determined now more than ever to take better pictures and take them more often. Read more books. When I think back to the number of books that I read in 2013, this was the year of getting back to reading. I will admit that I sometimes combine reading with the audio version of the book but all-in-all I have spent less time watching stories and more time reading and listening to them. In 2014, I completed: Gone Girl, Dark Places, Sharp Objects, The Giver, Me Before You, I’ll Give You The Sun, Eleanor & Park, Papa Hemingway and half of Still Alice. Not bad, considering I read nothing except plays in 2013. Resist the temptation for the following behaviors on Facebook: vaguebooking, passive aggression, attention seeking statuses or self deprecation. Better to say nothing at all. I have found myself thinking a lot more before I share something on social media, be it a status or a comment. There were even times when I would vocalize my thoughts to my husband and tell him that I am walking away from the computer. Still not perfected but getting better. Save $20 a week and use the money to fund one of the following in 2015: a writer’s retreat to Oregon for myself or a short cruise with Billy. Yeah, saving money was NOT something I did in 2014. Period. The end. See more movies at the movie theatre with a big bucket of popcorn in my lap and someone I care about by my side. I have seen a few movies this year but in the day and age of Netflix and streaming, the cost is so formidable. I did see Into The Woods, which was beautiful from a cinematography standpoint, even if I have no soul and don’t love the source material. Send more handwritten correspondence. This is something that I think is important and, in the age of technology, it is truly a lost art. I did not do a lot of handwritten correspondence in 2014, if any. I hope to in the forthcoming year. Spend no more than a half an hour a day on social media. Oh, the road to hell is paved with good intentions, isn’t it? Take more chances. Take those chances with the understanding that the answer might be “no” and that being told “no” is okay. I took a couple chances this year and most often was told “no” or “we’ll see.” I’m finding as I grow older that it doesn’t sting as much as it used to. I think I shall take more chances in 2015. Volunteer somewhere I am truly needed that is a place that will remind me of how blessed I am. I started volunteering with my daughter at Tails of Courage in Danbury this year. It has been a great experience thus far. She loves dogs and Tails of Courage rescues animals and facilitates their adoption. This is a perfect way to spend more time with my daughter and do something that makes a difference in our community and in the lives of innocent animals. Write every day. My writing, which is an avocation, has taken a curious turn this year. I started a new blog after my dear friend Jude passed away. I have been sporadic at best when it comes to posting to it. I also started reviewing local productions and writing columns for OnStage, a blog dedicated to promoting local theatre. In 2015, I hope to really put the pedal to the metal and complete a few projects. Learn to shuck my own oysters. Revisit and fine tune my abilities as a performer. Nobody in the area has a real sense of what I can do and my audition skills have gotten so rusty that I’ve not yet been afforded the chance to show them. Start a vegetable and herb garden in the spring. 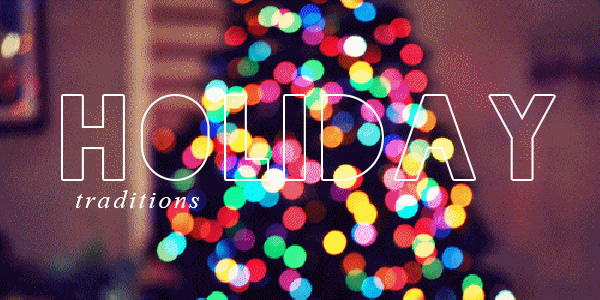 Every year is filled with challenges, some expected and most unforeseen. On the eve before my birthday, which also happens to be the start of a new calendar year, I am happy to have made it through the outgoing year without major incident and look forward to a new year with family, friends and experiences that make me the complicated, slightly imperfect but well-worth-knowing person that I am. It’s Christmas Eve and, despite my most fervent attempt to be as prepared as possible, I still find myself frantically trying to get everything “just so” in an effort to make Christmas as joyous and memorable as possible. As I was tying the final bows on the packages, I found myself thinking about the traditions that my husband and I have carried down from our families and the ones that we have started on our own. If you know my husband, he is a BIG fan of Christmas. I mean huge. As in, when we retire, he’ll probably dress up as Santa and be at local firehouse pancake breakfasts. As soon as the last Thanksgiving leftover has been consumed, the house is bedecked in festive decor, the only music that is played in the car is Christmas music and every Christmas movie known to man is watched in heavy rotation. We used to end the film fest on Christmas Evel with It’s A Wonderful Life but we’ve changed it up in the years past, adding The Polar Express and Arthur Christmas into the mix. 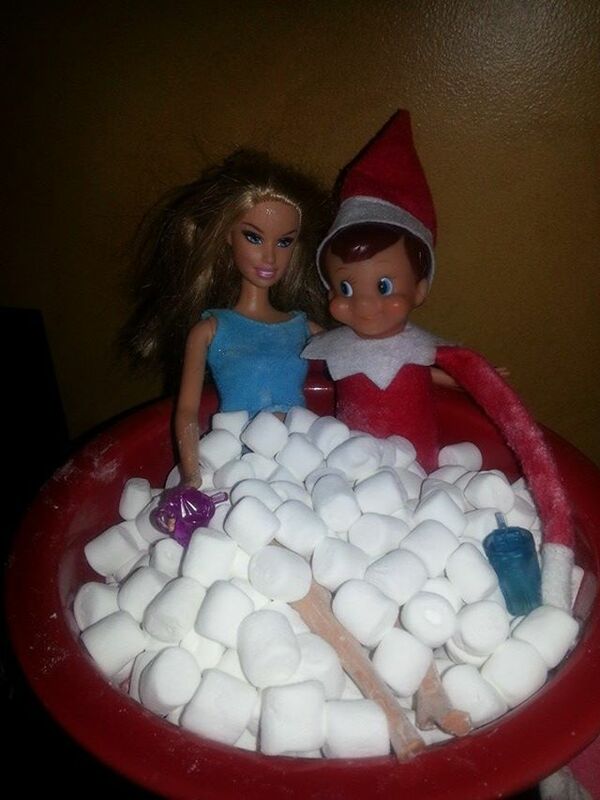 Another tradition that we’ve incorporated is the often-loathed Elf on the Shelf. I’ll tell you, Edwin the Elf was the best ally when the kids were little. He was also the guy responsible for delivering the Christmas jammies on Christmas Eve, a longstanding tradition in our house. Now that that kids know the story behind the little guy, they take pleasure in hiding him and setting him up in a “scene” or two. Years ago we would do a Harvest Festival in the fall, which is our favorite season. However, the number of birthdays, friends in shows and the conflict with Halloween tended to be a scheduling nightmare. Now each year we have a casual holiday open house, starting early in the afternoon and going until the last guest leaves. 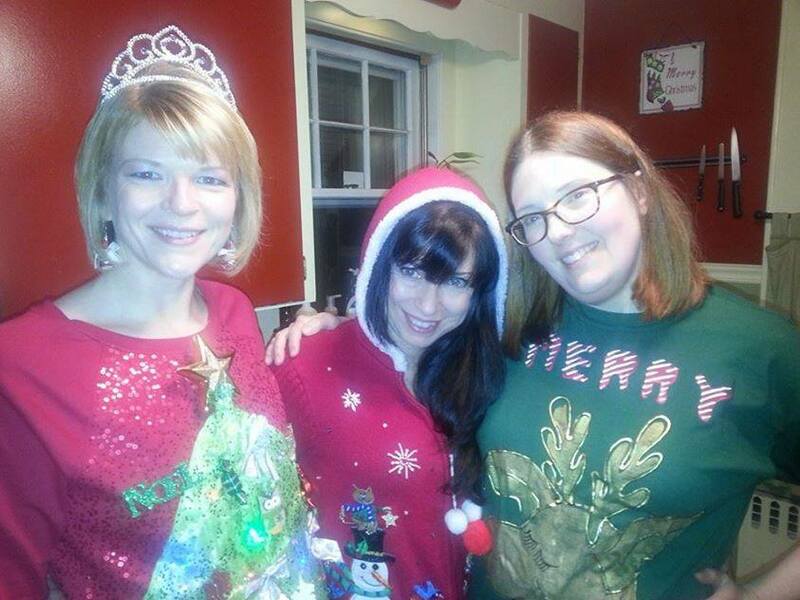 We try to incorporate some fun events, including a Yankee Swap and, new this year, an Ugly Sweater Contest. Since its inception, the Dempsters have loved The Joe Iconis Christmas Spectacular, which started at ARS Nova and has since taken up residence at 54 Below. The show features lots of irreverent moments with regular appearances by characters that include the Sweet Naked Baby Jesus, Drunk Mrs. Claus, the evil Ms. Needlebaum and the Christmas Angel. Joining Joe Iconis & Family are a bevy of Broadway stars that sing traditional and contemporary Christmas tunes including my absolute favorite: “Celebrate Christmas With Me.” I promise you, this is a Christmas concert not to be missed. Growing up, given that my father’s second wife was Italian, I spent many a Christmas Eve enjoying the Feast of the Seven Fishes, followed by attending midnight mass and then coming home to a boisterous parade where the youngest in the family had the honor of placing the Baby Jesus in the manger display that had been prepared for his arrival. I miss those days. However, if I were even to suggest a Feast with Just One Fish, given nobody in my family really likes fish, I think there would be a rebellion in our house. Instead, we now honor the tradition that was started by maternal grandmother: we make a big pot of chili. While not as extravagant, I found it to be a great stress reliever, especially in the years when we had hours of toy assembly and gift wrapping that still needed to be done. My grandmother’s philosophy when preparing chili on Christmas Eve was simple. It was something that could be kept warm and eaten at your convenience, whether your were a new mom putting an excited 5-year-old to bed or a weary traveler arriving late in the evening. When you were ready to eat, there was a hot meal on the stove. Not a super-unique tradition, I know, but one we’ve always done. We leave cookies and milk out for Santa and carrots for Rudolph and the eight reindeer. 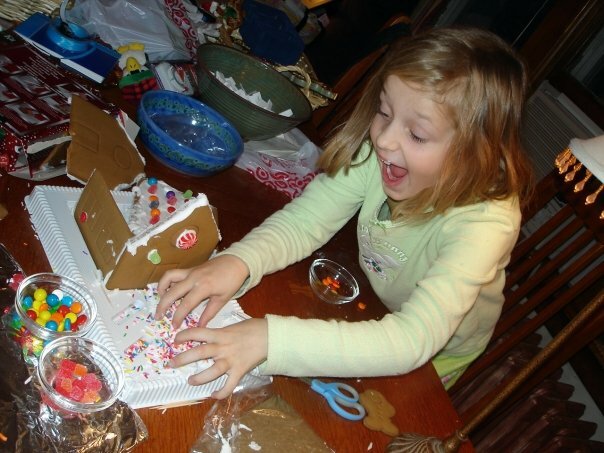 When the kids were younger, we would decorate the cookies, which had a very large amount of frosting and decorations, much to the delight of my husband who would step up every year to eat the sugary treats. This is a fairly new tradition in our house and one that neither my husband nor I did as a child. A tradition that is thought to have started in Germany, it is one that our decidedly un-German family has adopted. 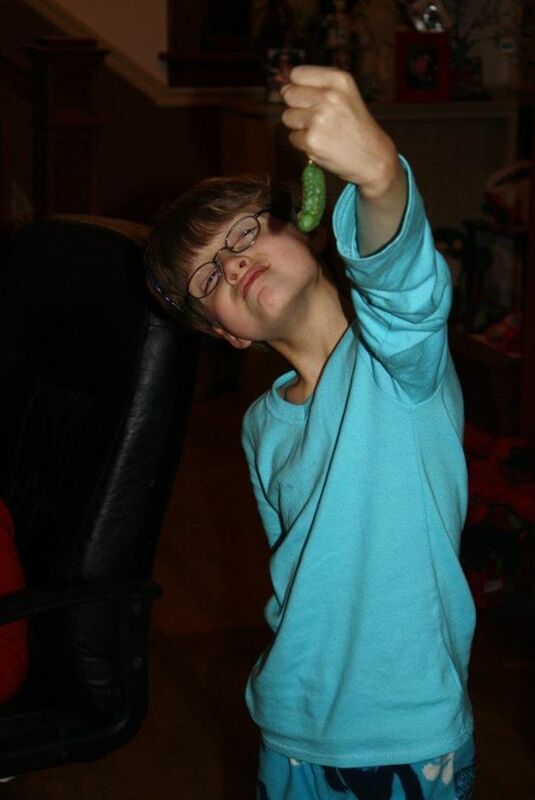 The night before Christmas, the pickle is hidden in the tree and on Christmas morning the kids hunt for it. Instead of bestowing a reward upon or promising good fortune to the person that finds the pickle, the lucky child gets to open the first gift of Christmas morning. When I was growing up, nobody was allowed out of bed until my father went downstairs to confirm whether or not Santa had come to visit our house. The reality of it is that he was probably starting a pot of coffee. Once we came downstairs, we were scurried to the dining table to have breakfast. Mind you, we were never breakfast people growing up but on Christmas Day, you were going to eat breakfast by jove. 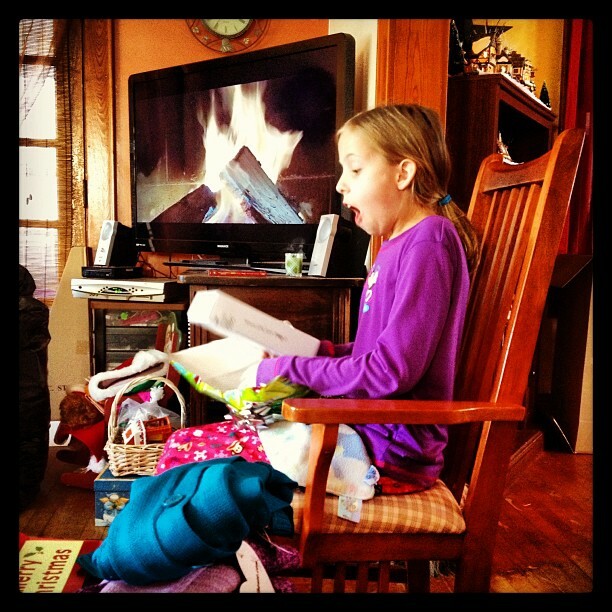 Thankfully, our stockings were doled out and we were given a taste of what was to come. My husband’s family has a tradition of preparing Pillsbury Orange Rolls, which are eaten in the living room amidst the Christmas chaos. He has now added the additional sugary rush of Monkey Bread to the mix, in case the kids are lacking energy. For Mom & Dad, there are mimosas and Bloody Marys. I don’t recall any of the adults of my youth sipping adult beverages on Christmas morning but maybe it was because they were sipping them into the wee hours of the night. Once the first gift has been opened, the opener then finds a gift under the tree for someone else and the family watches as each person unwraps their gift and selects the next. This is a nice way to spread out the events of the morning and to see what everyone has gotten. It also allows you to prepare the camera for those awesome moments when the recipient is thrilled with what they receive. Another tradition that we have incorporated, that has proven to be a savior many times over, is the assembly of the Elf Kit: scissors, box cutter, wire cutters, screwdrivers, pliers and batteries in all sizes. The Elf Kit has saved us from many a meltdown for that impossible packaging that needs to ripped away as quickly as possible so that the kids can begin playing with their gifts right away. While it was more of a godsend during the younger years, I don’t care what Amazon says, there is no such thing as frustration-free packaging, even for adult gifts. I don’t think there was a really a traditional Christmas dinner that I had growing up. For some reason, I think if we were going to have a fancy Christmas dinner, it was a turkey. As the years wore on, we tended to go with beef of some sort – prime rib or a roast beef. However, my mother-in-law, who preferred to spend the day with her family instead of slaving in the kitchen, fed her family steaks on Christmas Day. Let me tell you something, this is the perfect way to have a nice dinner without hours of prep and frustration. When we are preparing the meal on Christmas Day, this is what you will be served. It will be interesting to see what traditions continue as the children get old and what traditions they carry on with their families. One of the most important things we share with the generations before us and the ones that follow is tradition, whether keeping old ones alive or creating new ones. In the end, it isn’t the tradition itself, it is the memory of sharing them with those people that mean the most to us, near and far. May you and those people you hold dear make many pleasant memories this holiday season, ones that will sustain you in times of happiness and in sorrow for many years to come. Happy Hanukkah! Merry Christmas! Happy Kwanzaa! Joyous Solstice! Blessed Yule! On Thursday, I was at the office and some colleagues and I were discussing our weekend plans. One was grateful to be escaping the impending snow to attend a wedding in Florida, another was just looking forward to two days away from the office and I was brimming with the anticipation of filling the 10-yard dumpster that has been deposited in our driveway, hoping that the snow wouldn’t so apocalyptic that it interfered with my dumpster plans. My colleague looked at me with surprise as I explained that I had even taken Monday off so that I could have three days to fill the dumpster. “You’re taking time off to clean?” The look of disbelief on her face spoke volumes. Yes. I take time off to clean. I revel in the delight of the dumpster. It would be a safe assessment to state that I am genetically predisposed to collect things. There are places in my house that if photographed and taken out of context could easily appear on Hoarders. The anxiety that stems from this knowledge is omnipresent. Despite the order and coziness of my living room, knowing what was lurks one floor below is a constant source of unrest for me. So, from time to time, we rent a dumpster and we fill it. Every toss of debris chips away at the hoard but, more importantly, at my accumulated disquiet. Of course, this process is never a no holds barred purge of the clutter, which is why this is the third dumpster we’ve acquired in less than 18 months. The weekends devoted to the dumpster require thought, careful sorting, physical stamina and, God willing, a label maker. My husband and children are always willing to help, which can sometimes, unintentionally, be a source of tension. My youngest daughter, bless her heart, actually likes to spend time with me, even if it means cleaning! However, I have a method to my madness and the best thing to do, until I need beasts of burden, is to leave me to my own crazy devices. The payoff is a great. When the dumpster leaves us on Tuesday it will be filled to the brim and a bit more of our space will be reclaimed. I am sure that we will require at least one, if not two, more dumpster adventures in the spring but the good news is that there will finally be room for the Christmas tree!